Brea Grant set out to make a different kind of post-apocalyptic film, about two characters losing their valuable friendship. Combining indie film aesthetics with science fiction, Brea Grant explores a realistic vision of what could happen during a nuclear disaster, and forces the audience to confront how they would respond under similar circumstances. Packed with Special Features including Audio Commentary with the Director, Star and Cinematographer, Behind-the-Scenes Featurette And more! 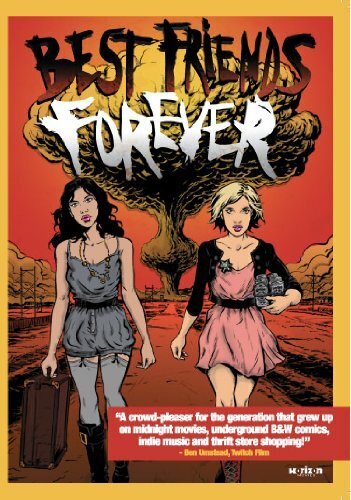 NEW YORK, NY - MARCH 7, 2014 - Horizon Movies is proud to announce that it will release Brea Grant's post-apocalyptic dark comedy Best Friends Forever , which was an Official Selection at the 2013 Slamdance Film Festival. The DVD will be released on March 25th with a SRP of $26.95. The DVD comes packed with special features including audio commentary with director/star Brea Grant, writer/star Vera Miao, and cinematographer Michelle Lawler, a behind-the-scenes featurette detailing the making of the film, the Best Friends Forever remix, a Kickstarter compilation video for the film, the "Art of Best Friends Forever" featurette, and the trailer. In Best Friends Forever , Brea Grant set out to make a different kind of post-apocalyptic film, about two characters losing their valuable friendship. Combining indie film aesthetics with science fiction, Brea Grant explores a realistic vision of what could happen during a nuclear disaster, and forces the audience to confront how they would respond under similar circumstances. Best Friends Forever is a post-apocalyptic Thelma and Louise, where the bond of two badass girlfriends can survive anything, even the end of the world. Harriet (writer/director Brea Grant) is a perpetually perky comic-book artist who has hit a dead-end in Los Angeles. She drags her party-girl BFF Reba (co-writer Vera Miao) along for a road trip to Austin, Texas. Just as they pull out of town, a series of atomic bombs explode across the U.S., and the duo's priorities have to shift from boys and beer to surviving the apocalypse. A dark comedy, heartfelt road trip and pulse-pounding disaster movie wrapped in one irresistible package, Best Friends Forever redefines the phrase "girl power" and asks the question: when faced with the end of the world - what is most important to you? Kino Lorber launched Horizon Movies in early 2012 as a home for mainstream independent movies. The label's most recent successes include the comedy Drawing Flies, the "lost" View Askew film from executive producer Kevin Smith; the found footage horror film, Fear Not; and the thriller, A Thousand Cuts, starring Academy Award(R) Nominee Michael O'Keefe, that was nominated for a Saturn Award for "Best DVD Release". With a library of 800 titles, Kino Lorber Inc. has been a leader in independent art house distribution for over 30 years, releasing over 25 films per year theatrically under its Kino Lorber, Kino Classics, and Alive Mind Cinema banners, including four Academy Award(R) nominated films in the last six years. In addition, the company brings over 70 titles each year to the home entertainment market with DVD and Blu-ray releases under its 5 house brands, distributes a growing number of third party labels, and is a direct digital distributor to all major platforms including iTunes, Netflix, HULU, Amazon and others.